Gift this Visually Christmas Fascinating Gift Collection to keep your beloved smiling and happy. 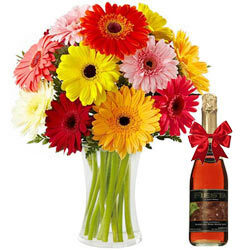 This Gift Colletion is decorated with a stunning Bouquet of 12 Mixed Gerberas and a Bottle of Sparkling Fruit Juice 650ml. Flower Vase N Brand of the Sparkling Fruit Juice may vary depending on availability in the city of delivery. Delivery possible only within city limits.